I was fortunate enough to get a sneak preview of some of the chapters and can say you are in for a treat. The book also has a wonderful forward from Dr. Stephen Alan Herrod and Mr. Jeffrey Snover. I think my favorite chapter might be the one on the SDK where the guys do a fantastic job of showing our users how to navigate the deeper waters of the vSphere API. So be sure to get your orders in early,,, and if you need business justification explain to your managers the amount of time you are saving by automating with PowerCLI. Congratulations to Luc, Alan, Glenn, Arnim and Jonathan ! This entry was posted in Uncategorized and tagged ESX vCenter, Mware vSphere PowerCLI Reference - Automating vSphere Administration on February 24, 2011 by Pablo Roesch. Just in case this is your first experience with PowerCLI here are some pointers to help you out. This entry was posted in vCenter and tagged getting started with powercli, new to powercli on October 29, 2010 by Pablo Roesch. I was lucky to catch up with Alton Yu – our VMworld 2010 Lab Captain for PowerCLI and get some insight into what he does and the PowerCLI labs. Alton is a really cool guy – if you happen to run into him during VMworld say hello. Q. What do you do at VMware ? A. I've been with VMware for over 4 years and have a deep technical background with VMware products having worked in technical support. I'm currently engaged with systems management and security partners in guiding implementations, aligning roadmaps, and troubleshooting API issues. Q. What got you into PowerCLI, what was your first impression ? A. I actually came from a Unix scripting background, so I didn't have high expectations for PowerCLI, but after installing it once and reviewing some of the cmdlets, I was instantly impressed with what the VMware PowerCLI development team had built. Having worked with the vSphere API for a year, I knew how much code it would take to do certain things. The lines of code needed to accomplish the same tasks in PowerCLI are so much less that I found myself using a PowerCLI window for many of the things I would normally open up a GUI to do. Q. How did you become the VMworld PowerCLI Lab Captain ? A. When David Deeths, the former lab captain decided that he was planning to transition into a new role, I just jumped at the opportunity. I'd been working with VMware labs for a couple of shows under him and he was an excellent mentor. I followed his guidance in doing the lab since '09 and repeated the same success formula ever since. Q. What should our Lab users expect when attending the PowerCLI Lab ? 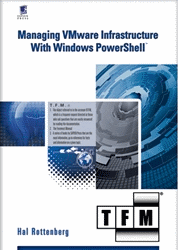 A The PowerCLI labs will provide hands on training for scripting a VMware environment. The goal is to provide all the tools needed to automate, integrate, and extend vSphere. Attendees will walk away from the lab with a better understanding of VMware Infrastructure, resources for using PowerCLI. Q. Do users have to be programmers to take the lab ? A. Not at all, PowerCLI is very easy to read and write. Of course, programmers will have an easier time, but anyone who has a little bit of experience with VMware and using the vSphere client will see that they can read the code and follow it and most will take it back with them and use it! Q. What is next for your Lab ? We hear this was met with tremendous success during VMworld A. We'll see. There are several ideas we have been throwing around. Perhaps we can see what the kind of response we get here. Some have asked for a perl lab to come back. Other ideas I've thought about were using the REST API for a vShield lab, using PowerCLI for View, or doing some cool things with Hyperic like HA or auto-scaling. Q. What do you plan on doing after Copenhagen, are you planning on resting after a incredible year? A. Just for a week. 😉 I'm planning to knock out the year with a bang! This entry was posted in Uncategorized and tagged alton yu lab captain, PowerCLI on October 7, 2010 by Pablo Roesch. bcaplay on Announcing the winners of the VI Toolkit Scripting Contest!